You can see how my mind works early in the morning. 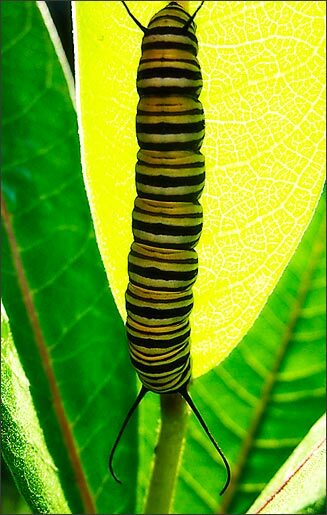 I pulled up yesterday’s image that I took over in the pasture of a Monarch caterpillar –feeding on a milkweed plant, of course. Limelight was also called calcium light. A flame was passed over the top of a cylinder of calcium which when burned gave off a brilliant white light. Such an apparatus was used on early stages and chiefly to illuminate the central character. Other lesser lights had to do for the supporting characters. Hence, there is nothing green about limelight. Except in this particular picture where one snazzy lepidopt is the center of attention. Previous Previous post: Where Were You the Day of the 2nd Big Bang?